Animal research has shown that the best way to get a rat to press a pellet-producing lever is to set the mechanism so that it doesn’t always release a pellet with each push. The unpredictability (or scarcity) of the reward causes the rat to seek it with more fervor. Casino owners are well aware of this phenomenon, gaming our brain’s natural wiring so that our occasional wins drive us to lose more than we would if our winning had a predictable pattern. I believe that the same principle is at work in physician reimbursement. Although most patients don’t realize this, physicians aren’t always paid for the work they do, and they are paid wildly different rates depending on how they code an encounter or procedure. After several health insurance denials of payment for legitimate work, physicians look for ways to offset their losses. Those may include changing the coding of their procedures to enhance the rate of reimbursement, exaggerating the complexity of an encounter, or (less commonly) billing for things they didn’t do. Because of the perceived injustice in a system that randomly denies payment for legitimate work, the physician feels less morally concerned about her over billing and coding foibles. And so a vicious cycle of reimbursement deprivation, followed by fraud and abuse, becomes the norm in the U.S. healthcare system. Payers say that physicians are greedy and unethical, and physicians say that payers deny reimbursement unfairly and pay rates that are too low to be sustainable. The government’s response is to hire a cadre of auditors to ferret out physician fraud while cutting reimbursement to physicians further. This is similar to reducing the rate of pellet release to the rats in the Skinner boxes, while randomly electrocuting them through the metal flooring. The result will be that rats will work harder to find work-arounds to get their pellets, including gathering together into larger groups to share pellets. This is occurring more and more commonly as solo practitioners are joining hospitals or large group practices to make ends meet. 1. 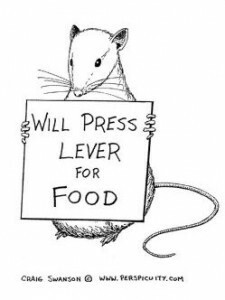 Rats are not evil because they press levers manically when there is a scarcity of pellets. Physicians are not evil when they look for ways to make up lost revenue. While fraud and abuse are always wrong, it is not surprising that they are flourishing in an environment of decreasing reimbursement and increasing health insurance payment denials. If we want to address fraud and abuse, we need to understand why it’s happening so that our “solutions” (i.e. hiring thousands more government auditors to investigate medical practices) don’t end up being as useless as shocking the rats. 2. Health insurance (whether public or private) is not evil for trying to rein in costs. Payers are in the unenviable position of having to say “no” to certain expenditures, especially if they are of marginal benefit. With rats pressing levers at faster and faster rates for smaller and smaller pellets, all manner of cost containment mechanisms are being applied. Unfortunately they are instituted randomly and in covert manners (such as coding tricks and bureaucratic red tape) which makes the rats all the more manic. Not to mention that expensive technology is advancing at a dizzying rate, and direct-to-consumer advertising drives demand for the latest and greatest robot procedure or biotech drug. Costs are skyrocketing for a number of good and bad reasons. 3. There is a way out of the Skinner box for those primary care physicians brave enough to venture out. Insurance-free practices instantly remove one’s dietary reliance on pellets, therefore eliminating the whole lever pressing game. I joined such a practice several years ago. As I have argued many times before, buying health insurance for primary care needs is like buying car insurance for your windshield wipers. It’s overkill. Paying cash for your primary care allows you to save money on monthly insurance premiums (high deductible plans cost much less per month) and frees up your physician to care for you anywhere, anytime. There is no need to go to the doctor’s office just so that they can justify billing your insurance. Pay them for their time instead (whether by phone, in-person, or at your home/place of business) and you’ll be amazed at the convenience and efficiency derived from cutting out the middle men! Conclusion: The solution to primary care woes is to think outside the box. Patient demand is the only limiting factor in the growth of the direct-pay market. Patients need to realize that they are not limited to seeing “only the physicians on their health insurance list” – there is another world out there where doctors make house calls, solve your problems on the phone, and can take care of you via Skype anywhere in the world. Patients have the power to set physicians free from their crazy pellet-oriented existence by paying cash for their health basics while purchasing a less expensive health insurance plan to cover catastrophic events. Saving primary care physicians from dependency on the insurance model is the surest path to quality, affordable healthcare for the majority of Americans. Will you join the movement? A friend of mine is in great physical shape but her husband (we’ll call him “Mr. B”) has gained 40 pounds since they were married five years ago. He also has familial hypercholesterolemia, and several of his relatives have had heart attacks at young ages. Mrs. B is distraught – she is worried about her husband’s health, and has tried to gently nudge him towards healthier eating habits and regular exercise (as well as taking a statin for his cholesterol). Unfortunately, the nudges were received as nagging, and a wedge has formed between them in their relationship. Unfortunately, the primary care physician didn’t offer any health counseling to Mr. B. Not only did he not mention that Mr. B should lose weight, but he didn’t provide any warnings about the dangers of untreated, very high cholesterol levels. He merely reported that Mr. B’s total cholesterol was 300, and that a statin was indicated. When I talk to internal medicine audiences around the country about the latest health policy flavor of the day – accountable care organizations (ACOs) – a typical reaction is skepticism trending toward cynicism. Many don’t quite get what ACOs are all about and certainly don’t want to be lectured about how they need to re-invent their practices. And they don’t buy the idea that ACOs will somehow save internal medicine primary care. The same can be said, perhaps to a lesser extent, about their reactions to PCMHs (Patient-Centered Medical Homes), P4P ( pay-for-performance), HIT (health information technology), MU (meaningful use), and the whole alphabet soup of other reforms being proposed to reform health care delivery and payment systems.